Janelle Monae is having a tender moment with cape-like jackets lately, à la her white and gold ensemble at the 2015 CFDA awards. Apparently, she's not done with this trend just yet. 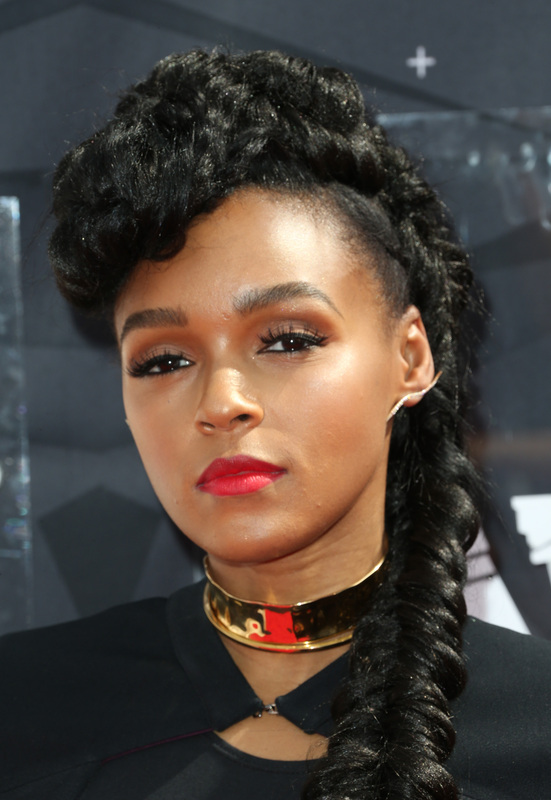 Janelle Monae rocked another cape at the 2015 BET Awards, and basically looked like a vampire-inspired goddess. Oh, and that hair though. Janelle gave the LBD a new twist—but not with a new shape or silhouette, but by throwing a chic, floor-length cape over it. What's that saying? "I'll stop wearing black when they make a darker color?" It's pretty spot on with Janelle's look. With a high neckline and ending just above her knees, it's definitely a flattering dress that she made her own by accessorizing. On the back, a large design was stitched on, giving the cape more depth and detail. To pull her look together, she wore a thick golden chocker, which helped to break the black up a bit. It doesn't stop there, though. While her dress was kept simple, she definitely made a statement with her hair. Coiled up in a gorgeous mega-braid, she actually looks like a legitimate queen. She's giving Khaleesi a run for her money with this one. As for her make up, she went with big, bold lashes, a semi-red lip, and of course, on-fleek eyebrows. I think we would all kill for her skin, and tonight is no exception. Her nails matched the red hue on her lips, and wrapped her look up with fabulous, mis-matched earrings. Janelle constantly makes it on my list of best dressed, and it's no surprise that tonight, she's in my top three.